Not long ago, dusk was a time of unease for the people of Magadi, a village in Kenya’s Kajiado County. As the sun set, farmers began worrying about their cattle, easy prey for hyenas and leopards. Children lit fires to finish their schoolwork, filling homes with smoke. Now as darkness falls, lights flick on across this sleepy hamlet, thanks to the efforts of more than 200 Maasai women at the frontline of a solar power revolution. The women, trained in solar panel installation, use donkeys to haul their solar wares from home to home in the remote region, giving families their first access to clean and reliable power. “For us, the impact of solar technology is unparalleled,” said Jackline Naiputa, who heads the Osopuko-Edonyinap group, one of the five women’s groups leading the alternative energy charge in the area. Renewable energy developer Green Energy Africa provides the group with solar products – including solar panels, lights, and small rechargeable batteries – at a discount. The women sell the products at a profit of around 300 shillings ($3) each, which goes into the group’s account to buy more stock. Naiputa, who in 2014 lost 10 goats to wild cats, said her teenage son used to spend cold nights in the cattle enclosure to guard their herd. Now, with solar lamps hanging around her homestead, Naiputa and her four children can sleep soundly in the warmth of their home. “The light scares the hyenas away, so we don’t have to worry about losing our animals at night,” she said. The Women and Entrepreneurship in Renewable Energy Project (Werep), an initiative by Green Energy Africa, aims to turn Kajiado County to solar power by training women as solar installers and encouraging them to market the clean energy concept to fellow pastoralists. The solar energy drive began in around November 2014, and so far about 2 000 households in the country have adopted solar technology. Barely seven months into the effort, the area has jumped from zero solar energy consumption in 2006, according to estimates by the government’s Arid Land Resource Management Project, to 20 percent today, energy experts say. Compared with kerosene and firewood, the cost, convenience, and health benefits of solar are proving hard to resist. “The nearest market where one can charge a cell phone or buy kerosene is 15 kilometres away, and it is only held one day a week,” Naiputa said. Before going solar, her household used to spend 40 Kenyan shillings ($0.40) a day on kerosene and over 100 shilling ($1) a week charging the two family cell phones. As well as saving villagers money, the switch to solar could help slow down the destruction of Kajiado County’s trees, which now cover just 1 percent of the area’s land, according to the National Environmental Management Authority. And as more villagers choose clean solar energy over wood and coal to light and heat their homes, fewer will suffer the effects of inhaling the smoke that comes with their nightly fires. According to a 2014 World Health Organization report, household smoke was responsible for 1.6 million deaths worldwide. 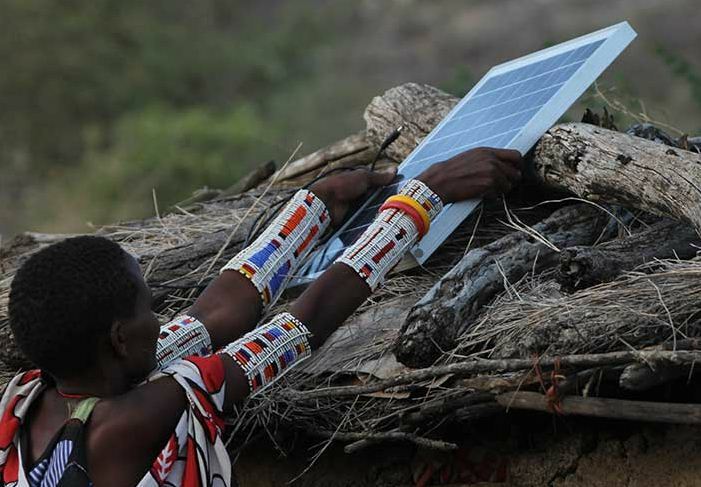 Edwin Kinyatti, the CEO of Green Energy Africa, said the uptake of solar energy was likely to continue “since it is affordable to most Kenyans,” even though cultural barriers, low literacy levels and difficult terrain had all presented some obstacles to the Kajiado County effort. Even as the country’s middle class continues to grow, access to electricity remains low, with 68 percent of the population either too poor or too remote to connect to the national grid. “Kenya has great potential for the use of solar energy throughout the year, thanks to its location near the equator,” said Lamarck Oyath, an energy expert and managing director at Lartech Africa Limited, a technology and consultancy firm. “Yet so far, the country gets less than 2 percent of its energy from solar power,” he said. For villagers like Naiputa, however, solar is proving a big benefit – and not just because of the clean power it provides. Leopold Obi for the Thomson Reuters Foundation, the charitable arm of Thomson Reuters, covers humanitarian news, climate change, women’s rights, trafficking and corruption.